Qoahito Cultural Landscape is part of the Tentative list of Eritrea in order to qualify for inclusion in the World Heritage List. The addition of Qohaito (UNESCO says “Qoahito”) to Eritrea’s T list in Mar 2011 came as something of a surprise to us as we had visited it in late 2006 without being particularly impressed. Of course the site is in a very undeveloped state with very little having been excavated and its significance may well be much greater than its visible remains might indicate! Interestingly, Eritrea now seems set on nominating it as a cultural landscape covering, inter alia, the archaeological remains of a city dating from around 100-700AD (and, possibly much earlier), together with cave paintings of various periods and today’s landscape as traditionally farmed by the Saho peoples set on a high plateau next to an impressive steep escarpment dropping 2500mtrs to the Red Sea. Indeed the T list description refers with some justification to the “dramatic natural features and great scenic beauty”. Now “Cultural Landscapes” have recently been a successful route for African countries to gain inscription, but the T List description of this site gives the impression of an unfocussed, catch-all approach clutching at anything which might have some significance/value! The 3 sites are historically linked since they were all significant sites in the Axumite era. Adulis being the port through which goods traveled to/from Axum via Matara/Qohaito (and other places up on the plateau). The Eritrean T List introduction claims that “Qohaito developed and prospered before the rise of Aksum as one of the precursors of the Aksumite civilizations and developed a complex society during the heyday of Aksum around 100-700 A.D.” Whether this pre-Axumite claim is to get one over the Ethiopians or whether it is to claim something special for Qohaito over Matara/Adulis isn’t clear. The Matara/Qohaito comparison also has another dimension. The “Periplus of the Erythian Sea” is a 1st century AD seaman’s/merchant’s “itinerary” covering places as far away as India and East Africa with which Rome traded. One section states "From Adulis it is a journey of three days to Koloe, an inland city that is the first trading post for ivory, and from there another five days to the metropolis itself, which is called Axomitesl". But where was “Koloe”? As early as 1893 it was linked to Qohaito but more recent theories prefer Matara – partly on the basis that Qohaito doesn’t appear to have been a true urban centre. Whatever – we never managed to see Matara and there wasn’t a lot on view at Qohaito either! The 2 main sights are as follows - A few walls and pillars from the Temple of Mariam Wakiro (photo 2) – which is described at various Web sites and in various books as being either “pre-Christian” or “Christian”! And Saphira Dam (photo 1) which is also variously described as being “pre-Axumite” or “Axumite”!!! Take your choice! We found the dam quite interesting as a comparator with another monumental dam at the remains of Marib not far across the Red Sea in Yemen - but it really wasn’t a sight to go out of one’s way for!! There is also an underground rock cut tomb called, almost certainly without justification, the “Egyptian tomb”. The walk along and partly down the escarpment to see the rock paintings was worthwhile for the views but the paintings themselves didn’t appear to have any particular merit beyond many others in Africa which are not inscribed. this report in 2000 may be indicative of activity regarding Qohaito which has led to its recent inclusion on Eritrea’s T List. It misses no opportunity to criticize Ethiopia for its failure to protect and promote Eritrea’s cultural heritage, and claims -“In fact cultural Heritage was totally ignored or neglected for political reason”. But it also states, incorrectly “There was not a single nominated site in Eritrea during the Ethiopian colony not even the site of Adulis which is universally known. (Dated 2nd millennium B.C almost 4,000 years old). 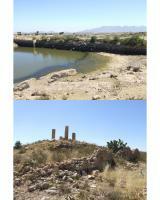 But now Eritrea has five archaeological site nominated for World Heritage List”. As stated above, Ethiopia did in fact nominate Adulis and Matara on 4 different occasions. Herewith a link to the minutes of one deferral - http://whc.unesco.org/archive/1980/cc-80-conf016-10e.pdf. Note that those 2 sites had reference numbers 11 and 14 respectively showing how early Ethiopia had registered them! Also, as yet of course, Eritrea doesn't have 5 archaeological sites "nominated" - but "watch this space" I guess!